I absolutely adore Louise Rennison! I loved her Georgia Nicolson books so much and when I started reading the Talullah Casey series it was always in the back of my mind that Talullah was just not quite as funny and mad as her cousin, Georgia. 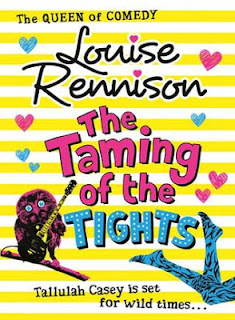 And then I read The Taming of the Tights the third book by Louise Rennison in the Tallulah Casey and you know what? I've completely changed my mind. I'll always have a soft spot for Georgia, but my heart now belongs to Tallulah! The thing that gets to me the most about Tallulah is how much crap she gets from everyone around her. One particular teacher at school, the village girls, even the man who runs the pub next to where she lives doesn't go easy on the poor girl. And throughout it all Tallulah hods her head up high and carries on. She does crazy owl raps and gallops about like a horse in front of everyone and does weird Irish dancing and puts up with the name calling and the glare-y looks and the incessant insults and people laughing at her. And while 90% of this book is absolutely laugh-out-loud funny, there are still moments where my heart absolutely breaks for the treatment that Tallulah receives from those around her and those moments are the ones in which I feel the most connected to her. I want to give her a big hug and I want everything to work out for her. The other thing that I love about this book is how easily Louise Rennison changes my mind about characters. At the end of the previous book I was filled to the brim with excitement over the latest development in her romantic life ... and then I read this book. And instead of carrying on with that same excited feeling about two characters maybe-possibly starting something, my mind has been changed. And instead, I'm rooting for someone else entirely because it seems like this other person might be better suited for Tallulah. Things could go either way at this point and it all makes me feel a little bit giddy with excitement! Yeah, it's a really good one! I love this series a lot. 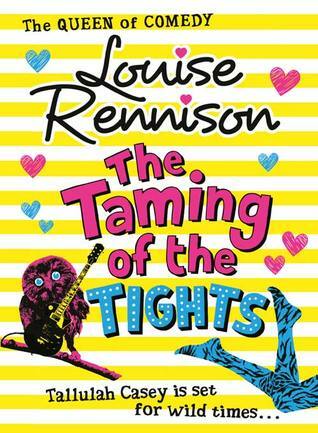 I'm not a huge fan of Louise Rennison's books for some reason but I'm going to try and start this series soon. I feel like I'm missing out on a lot! Are you not? I find that surprising :) I love how easy Louise Rennison makes writing comedy look, when the reality of writing really funny scenes must be so different. Yes, another Louise Rennison fan! I'm a huge fan of Georgia Nicholson but I haven't picked up this series yet. I'll definitely try it soon. I'm nearly finished with this and I totally know what you mean. It's by far the funniest of the series so far and I've fallen in love with the lot of them! It such a fantastic bunch of characters, isn't it?! I love Louise Rennison so much.